NOTE: This tree below the county map was created for viewing on a laptop or PC. It may be displayed accurately on an iPad or tablet. It will be really messed up on a smart phone. On September 19, 1827, General Lewis Cass negotiated the final treaty between the United States government and the Potawatomies inhabiting southern Michigan. Perhaps without knowing what they were doing, the people who had lived in the region for hundreds of years were agreeing to leave it so settlers could begin to farm the land. The area now designated Hillsdale County was originally part of Lenawee County. On October 29, 1829 it became Vance Township. Then, on December 13, 1834, Vance Township was renamed Hillsdale County and split into four townships: Wheatland, Fayette, Moscow and Allen. Divisions in each of the four occurred over the years until we arrived at our current 18 townships within Hillsdale County. In the 1820's and 1830's the United States government actively encouraged the settlement of the "western lands," which included the Michigan Territory. Some of the settlers wanted space and privacy, but most desired neighbors. With a small population individual voices had more power, and participation in local government was common. Townships were formally established to facilitate elections, town meetings, meetings of the township board and to make the distances people had to travel more managable. When the townships were named, sometimes it was a mere formality; others came with a story attached. Here are some of the more interesting bits of history concerning the evolution of the townships in Hillsdale County. Allen Township took its name from Allen Prairie. Moses Allen was the first white settler in Hillsdale County. He had been part of a surveying team charged with establishing the route for a road between Detroit and Chicago. Moses and his fellow surveyors pretty much followed the well-worn path that the Native Americans called the Sauk Trail. When Moses reached the about the present intersection of US12 and M49 in Allen he looked at the prairie and envisioned a prosperous farm for his family (as well as a profitable tavern that would provide food and shelter for the expected traffic following the new road). Moses brought his family to that spot when his surveying job was complete. The area became known as Allen Prairie. The initial survival of the Allen family (and many others in Hillsdale County) depended on the care and largesse of the Potawatomies who hunted and fished in the area. Moses Allen gave his name to the town of Allen and, when Hillsdale County came into formal existence, was honored by having one of the original four townships carry his name. Scipio Township had a precarious grasp on its existence. In March of 1836 Scipio Township was created from a portion of Fayette Township, the northwestern township in the original group of four. However, in March of 1867 Fayette took back three of the southern sections. Then, in April of 1868 it took back the other three southern sections of Scipio Township, leaving a nice straight border between the two townships. There's no confirmed account of why this "take-back" happened or whether it was just a sign of some surveyor's need for tidiness in borders. The enthusiastic influx of settlers created population centers throughout each of the original townships that were sufficiently large to warrant carving up the existing township to create multiple townships. Most of these divisions were without excessive drama. Reading Township was created from Allen Township and later gave some of its land to create Camden Township. The same sharing occurred when Fayette Township was first broken up to create Woodbridge Township and then, the following year, Woodbridge Township gave up land to the newly createdCambria Township. Pittsford Township, which was originally part of Wheatland Township, gave up land to Canaan Township, which was later known as Wright Township. In what seems to be a classic case of warring factions among the citizenry, the most interesting story involves Ransom Township. It begins reasonably enough. Moscow Township gave up land toFlorida Township (which later became Adams Township). This was a HUGE area, encompassing all the land from Moscow Township to the Ohio line. The southern portion ofFlorida Township became Rowland Township, named in honor of its first settler Rowland Bird. But there was some agitating on the part of the inhabitants of the most southern part of that township, in the area that was to become Amboy Township. Several years after Mr. Bird's death they were successful in having the name changed to Ransom Township. The following year the non- Amboy faction managed to have the name changed to Bird Township in another attempt to honor the first settler's memory. They were only able to maintain that name for a year. In 1850 the township received its final name: Ransom Township. That same year the southern parts of bothRansom Township and Woodbridge Township contributed land for Amboy Township. 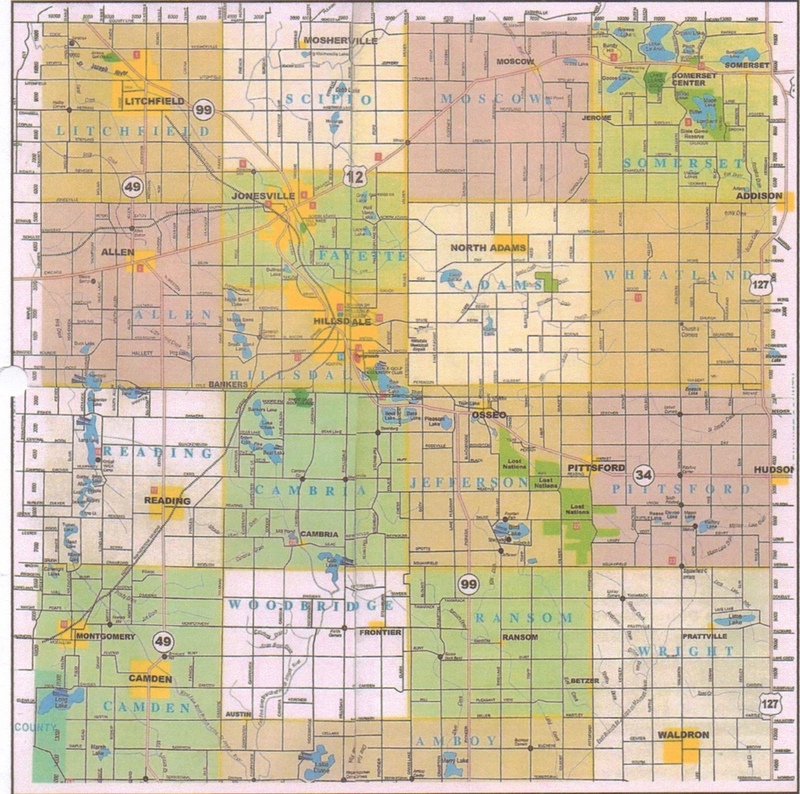 A map of Hillsdale County shows tidy rectangular townships, with Amboy Township a squashed rectangle against the Ohio Border. Except for an incident fifteen years before the birth of Amboy Township, there would have been an additional small hunk of land at the southeastern part of the township (as well as in the southern portion of Wright Township). Michigan lost that strip of land to Ohio in the "Toledo War," waged over whether Michigan or Ohio would claim the town and port of Toledo. Militias from the state of Ohio and the territory of Michigan arrived on opposite sides of the Maumee River and proceeded to throw taunts and insults at each other. This single military confrontation of the "war" ended with a report of shots being fired into the air, incurring no casualties. (THIS is the way wars should be fought!) Through a legislative compromise, Ohio was awarded Toledo and Michigan was given statehood and about three-quarters of the Upper Peninsula. Michigan initially thought they'd been ripped off - but the discovery of copper and iron deposits as well as plentiful timber in the UP helped to soothe their irritation.